Amazon has launched a new restaurant delivery service in order to compete with sites like Grubhub and Eat24. 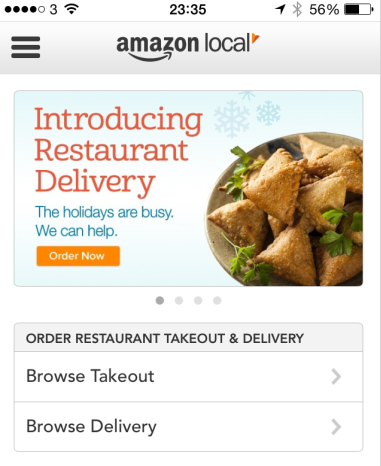 Amazon’s takeout and delivery service was turned on over the weekend without much fan-fare on the Amazon local app. Presently, the service is only available in Seattle but it includes around 20 restaurants in the area for delivery and around 110 for pick up orders. Amazon is planning to expand their restaurant delivery services to other cities however, no time line has been given as yet. The move by the e-commerce giant is just he beginning as the company also has plans to launch their own review marketplace in order to compete with Yelp and their own travel service called Amazon Travel which will compete with sites such as Trip Advisor. Amazon Travel is rumored to launch on January 1st but much like Amazon’s restaurant service, the company is keeping most of their new ventures very low key for now.